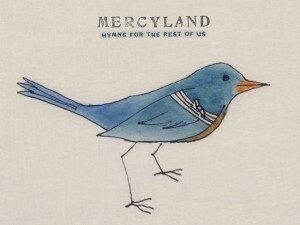 An Easter vacation was the perfect opportunity to listen to “Mercyland: Hymns For The Rest Of Us” a compilation release by singer/songwriter, producer and musician Phil Madeira. As the title suggests the thematic underpinning of the album is spirituality but, luckily, this is not the God-as-backdrop trotted out in too many Music City productions. Nor is it a blandly fuzzy new-age soundtrack to glaze your eyes. Community runs deep in Mercyland. Started by Madeira as a project on the crowd-funding site Kickstarter, the project achieved it’s funding goal of $5,000 and went on the an an additional $32,205 on top of that. Like one of the albums contributors and fellow traveler, Buddy Miller, Madeira reminds us that the divine can come from common places. Reaching back to a source of faith that nourished bands like the Louvin and Stanley brothers and later by Johnny Cash and Billy Joe Shaver, these are songs of common experiences of love, hope and grace. Some of Americana music’s finest have gathered here to bear witness. Miller, Emmylou Harris, The Carolina Chocolate Drops and others work as missionaries that work across faiths and genres to create a unifying spirit of music. The Civil Wars begins things with joyful noise as with “From This Valley” John Paul White strums his acoustic guitar and hollers “Woo hoo!” He and Joy Williams voices intertwines and soars like morning doves. The greatest and most enduring gospel songs, from The Great Speckled Bird to Amazing Grace, are master works of allegory and allow a richer and deeper musical expression and broadness in narrative to speak to beauty, devotion and sacrifice. Phil Madeira and his musical congregation do good and great work on this collection of songs that inspire without beating you over the head with the Good Book. They also don’t put you to sleep in the pew to dream of post church fried chicken. That’s a miracle it itself.